This book was commissioned in 2017 by Amazing Space 2 for the Tree-house Library. I did the writing on site between the full moons of June and July, and the editing, layout and book-construction in August. 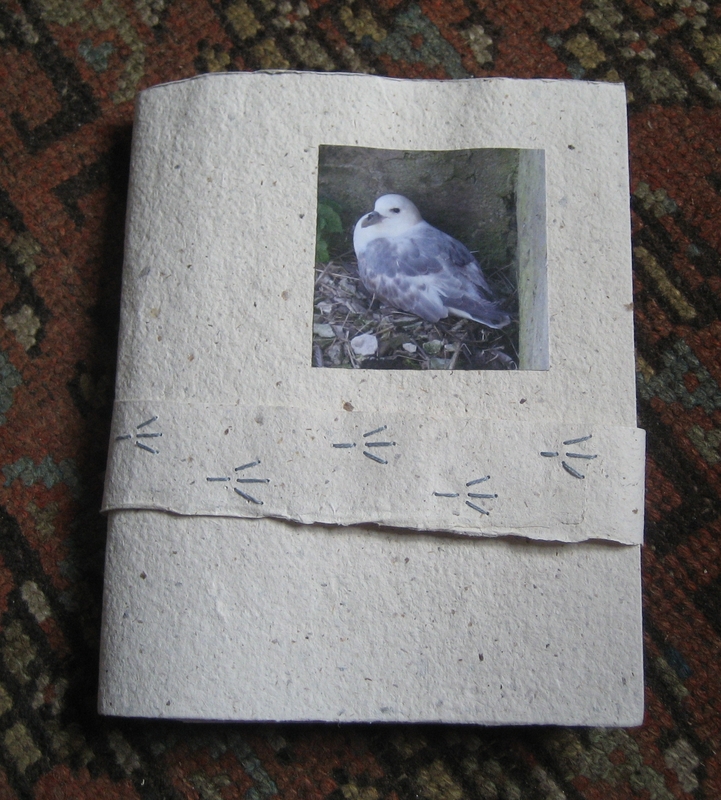 136 pages, 209 three-line stanzas, 15x15x4cm, it is a six-needle Coptic sewing with alternating folios and single pages and includes photographs and leaf-prints from the fields, woods and gardens around the Dove Studios in Somerset. 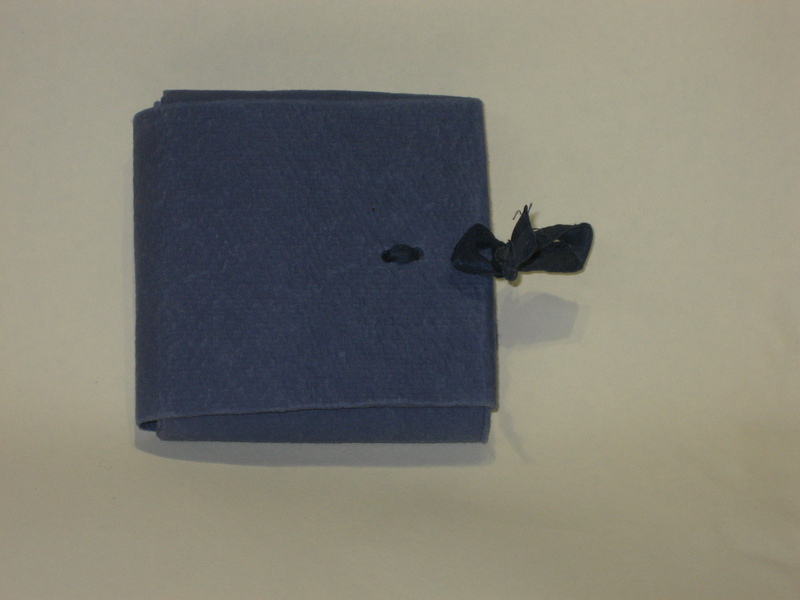 The book-cloth for the cover was dyed – with stitched resist – in an indigo vat, and pasted to thin oriental paper. Sculptural book of three pages, 28x36cm closed, 28x70cm open. The largest raven was made separately and can be revolved on a hidden pivot. Structure: “Dream-book”, invented by Mark Wangberg, USA. Materials: deconstructed cardboard box, wooden skewers, gesso, home-made indigo paint, deconstructed clothing catalogue, Polyvine matt acrylic varnish, brass paper-fastener. The large lettering was done with home-made rubber stamps. Commissioned wedding-present. 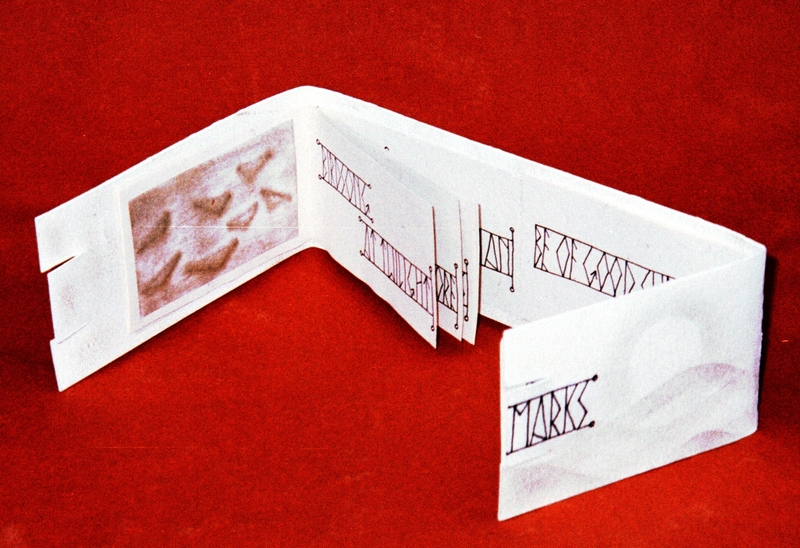 A5 single-sheet 4-needle Coptic sewing. 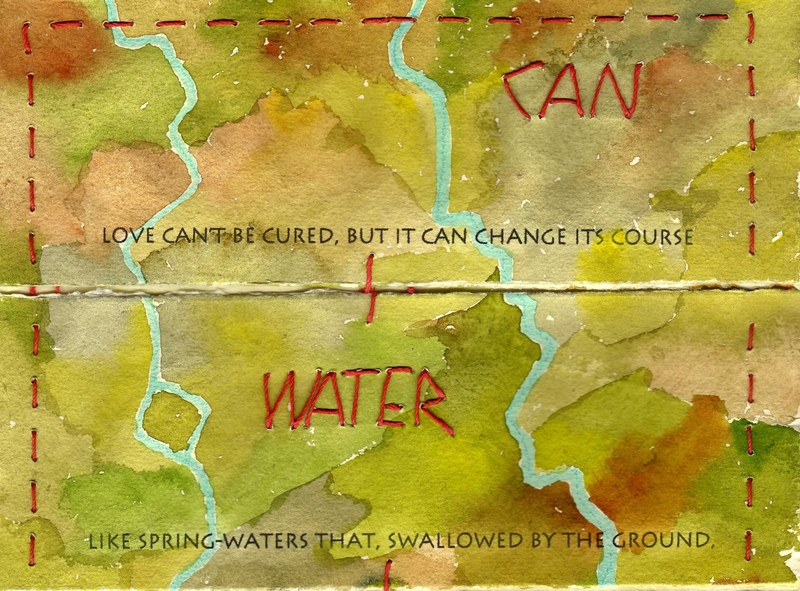 The book includes several poems and two original watercolours. Fortunately my hoard included a piece of silk ikat fabric in the same colours, and a sheet of decorative paper that I used to line the covers. Made in April 2017. My paternal grandmother Phyllis Arnott was born at Levino near St Petersburg on 22nd December 1894, the younger daughter of James Hamilton Cundell, a Scottish civil engineer, and Etty Verena, neé Goodier. The family, including Etty’s mother Mary Ann Radnor Goodier, moved to England in 1901. Phyllis wrote to her mother in the spring of 1903 while she and her older sister Dorothy (Doris) were staying at Folkestone. Russian, which is spelled phonetically, was her first language. It is clear that she had trouble with English spelling! Her beautiful handwriting is in the style of the C19 Russian copy-books from which she learned to write. In one letter she asks her mother to “plis bring sum kopibuxs”. 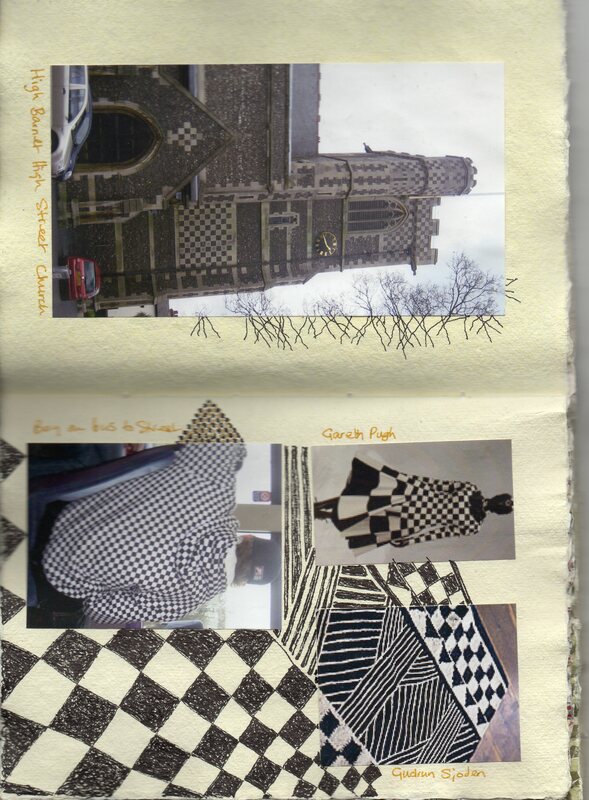 Dearist Muther: Phyllis writes home: Zigzag book of 14 pages. Materials: Jessops 170gsm matt photo paper, Lana Colours paper cover. I have also made a few copies as an A5 pamphlet, open edition. 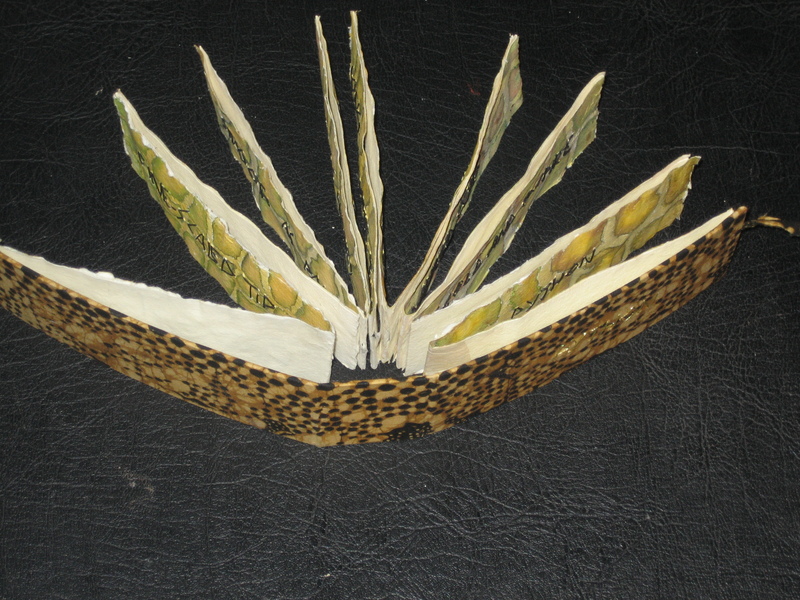 Sculptural book of 7 unequal pages. Materials: deconstructed cardboard box, wooden skewers, gesso, Dulux paint, deconstructed clothing catalogue, Polyvine matt acrylic varnish. Size closed 32x19x5cm, open 32x up to 70cm. Made in August 2016. 30-page album made for the Coate family in memory of the painter Peter Coate RWA. Each page was pamphlet-sewn onto a thick Khadi-paper accordion fold which was then sewn onto a pair of lined leather straps. The straps were pasted and stitched onto boards covered with hand-marbled paper. There are sufficient packing-stitches to give plenty of room for expansion when photos etc were added to the album pages. The pages are fragments of slate found while gardening and hoarded pending inspiration. I suspended them from a twisted branch of rosemary. They make a pleasant tinkling sound. I used an engraving tool to write a short poem on the largest piece, an epigraph on the next-largest, and symbolic marks on the others. Made in April 2016. 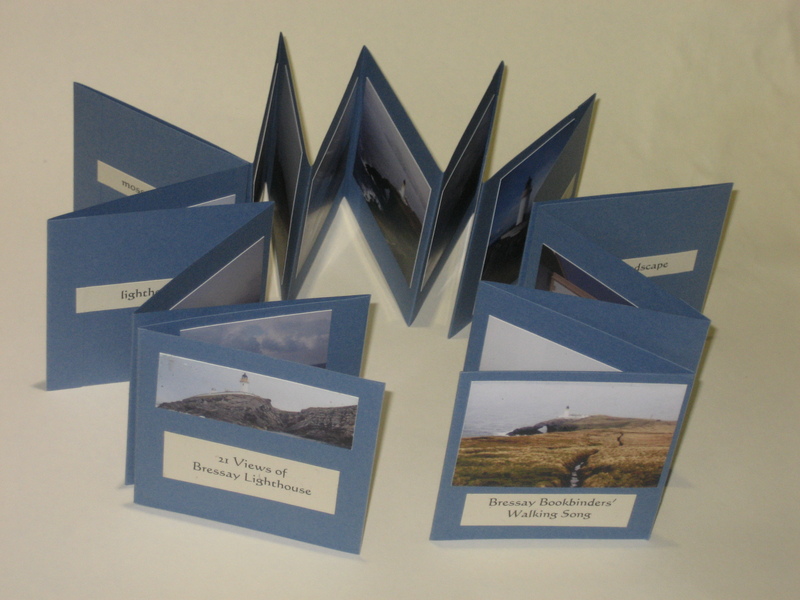 Two tiny folded gallery-books in a simple folded slip-case. Each displays nine photographs from Lewis in the Outer Hebrides. Gneiss is the predominant rock locally, a spectacularly banded and textured metamorphic rock 3 billion years old – 2/3 as old as the Earth itself. Calanais (Callanish) is a prehistoric stone circle. A tiny one-off pamphlet with a New Year card as the cover. The card itself is part of a repurposed tree print by Lilla Duignan, and carries her greeting to me inside the back cover. I scanned the card and printed it on translucent paper for the outer pages. 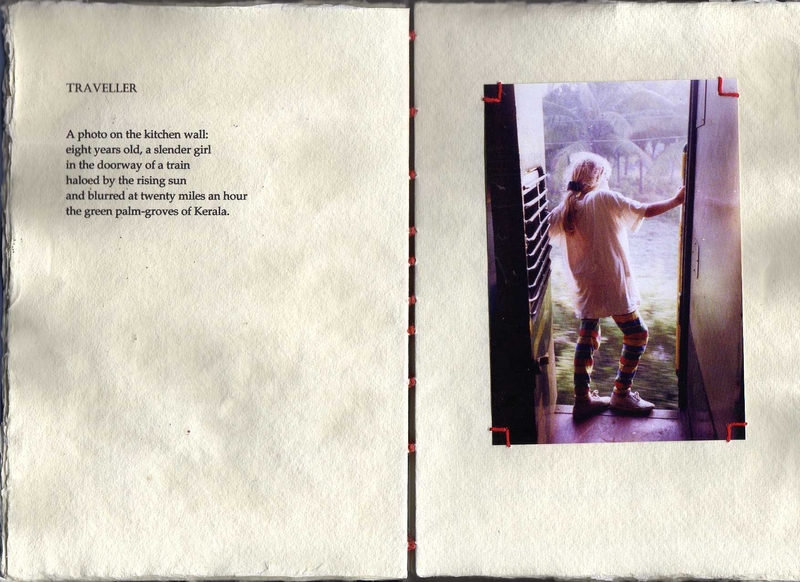 The inner pages feature a poem called “Lost“. None of my own work – I just put the book together. Made in January 2016, 8×9.5cm. 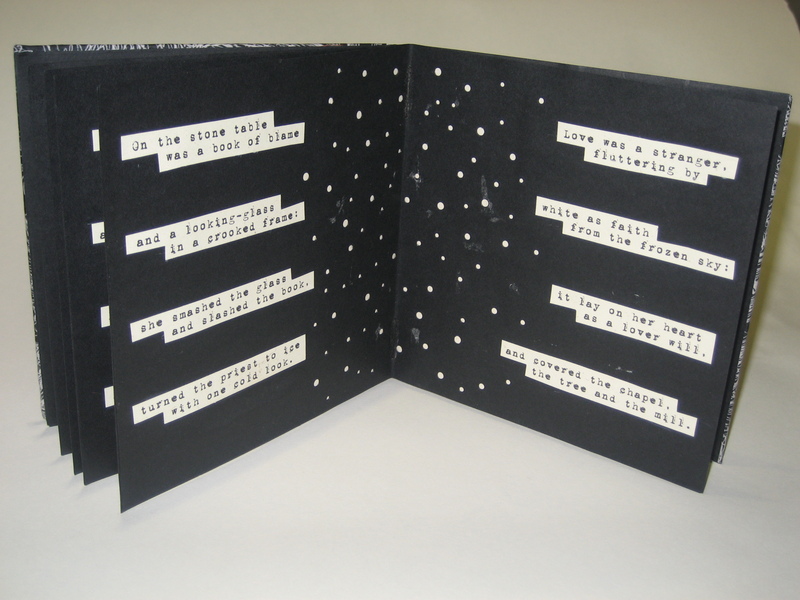 This is a little book I made for the Amazing Space exhibition during Somerset Art Weeks 2015. It is a flutter-book of twelve photos of eye-like features on the bark of various trees in the Circle of Trees at the Dove. Edition of three, non-identical. Size 7×9 cm. The book is its own gift-box. Open, it is 24cm square. 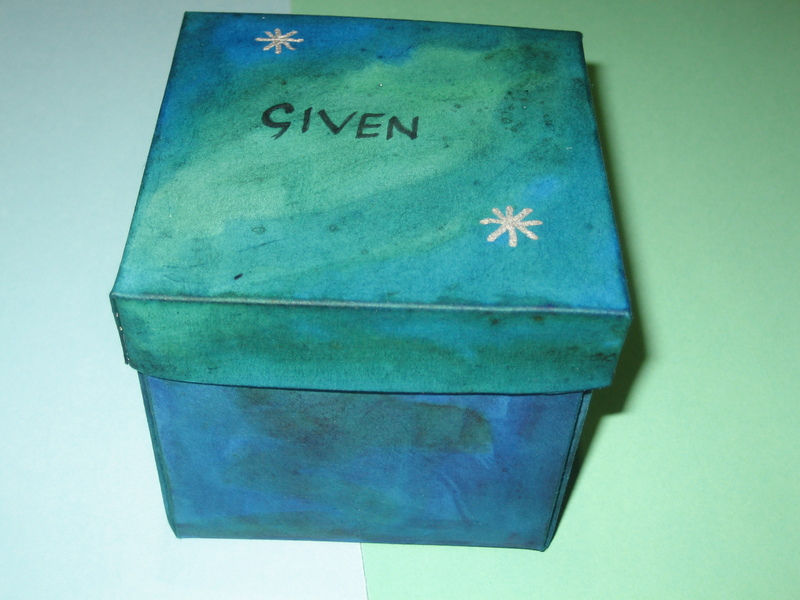 Closed, an 8.5cm cube. Made in March 2013. The text begins at the small star on the upper right side. This little concertina book is only 9cm square when closed but nearly 2 metres long when stretched out. The “views” are on one side and the “song” on the other. 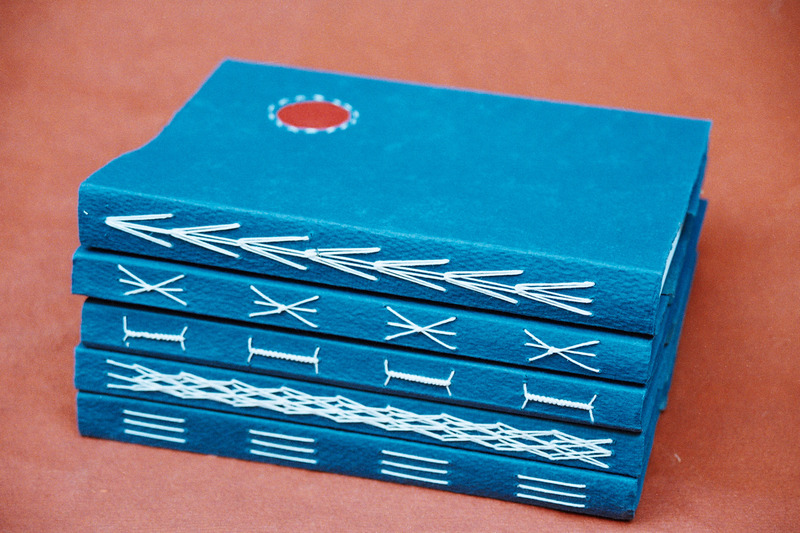 It has a simple paper case with a ribbon attached – pulling one end of the ribbon helps the book out of its case, and tying the two ends keeps the book safely enclosed. I made this in 2011 for a good friend in Shetland, but made a small mistake part-way through, so I kept this one and made another for her. 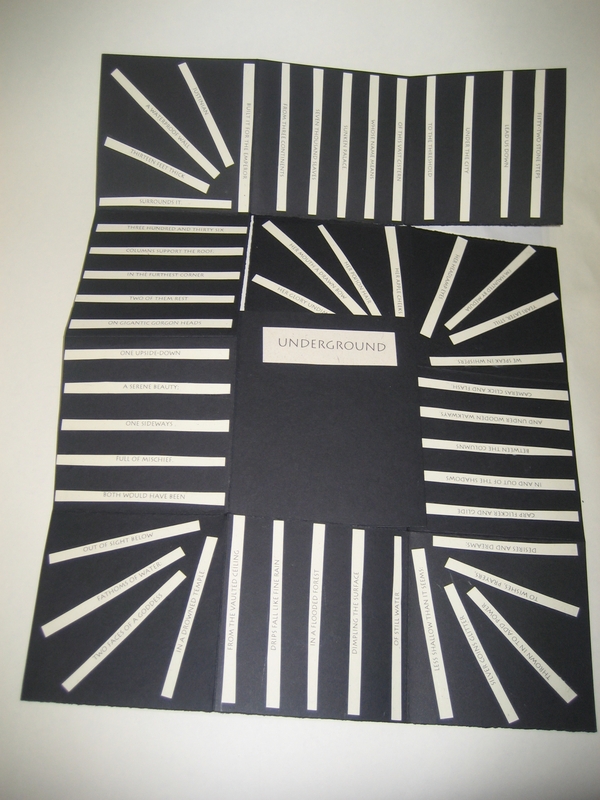 Underground: a hybrid book inspired by the Basilica Cistern in Istanbul, which I had the great good fortune of visiting with my son. 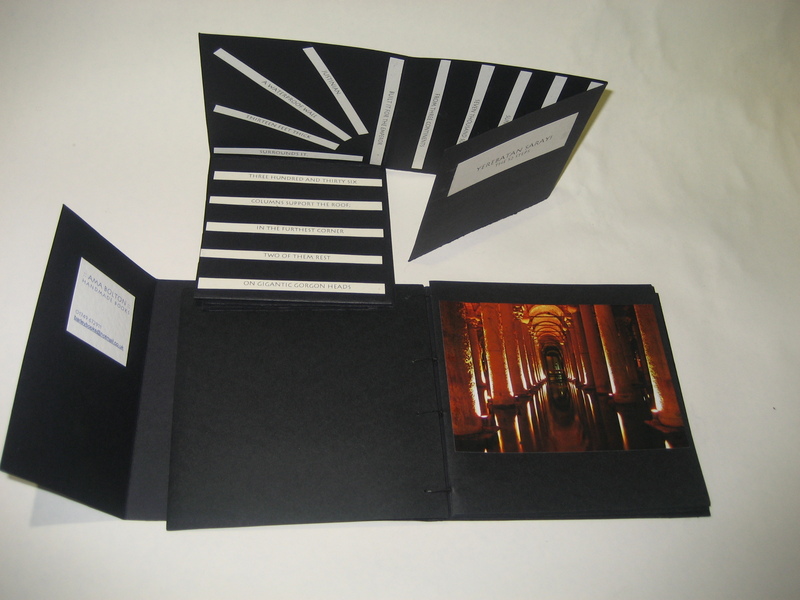 The text, representing the 52 steps down from street-level, is pasted onto a spiral cut from black card, which in turn is pasted onto the front of a coptic-sewn photo album. The cover folds around the whole thing and conceals/reveals another photo and the maker’s name. Closed, it is a little under 14x14cm.Made in 2011. 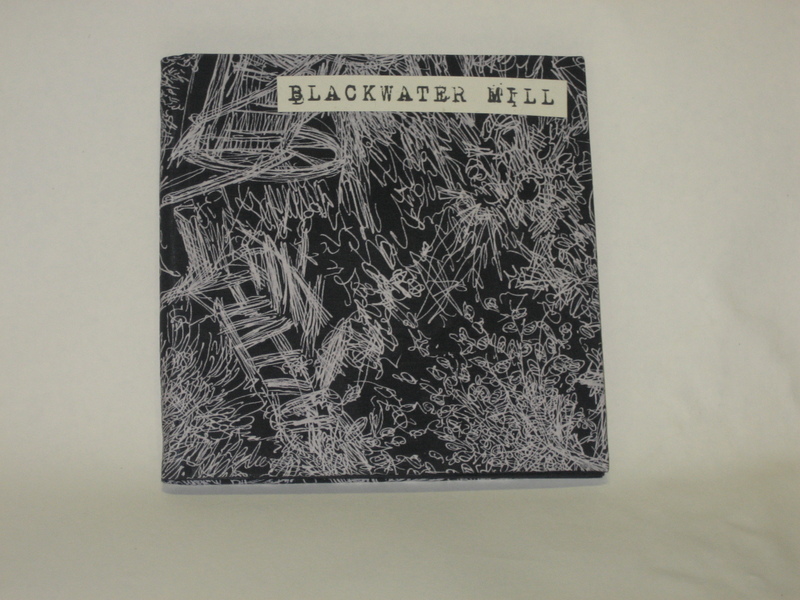 Blackwater Mill. Another book from my “black ” period in 2011! A dark story inspired by a dream and influenced by listening to Annie Lennox, specifically “Love is a Stranger”. It begins Love was a danger, red as rage. 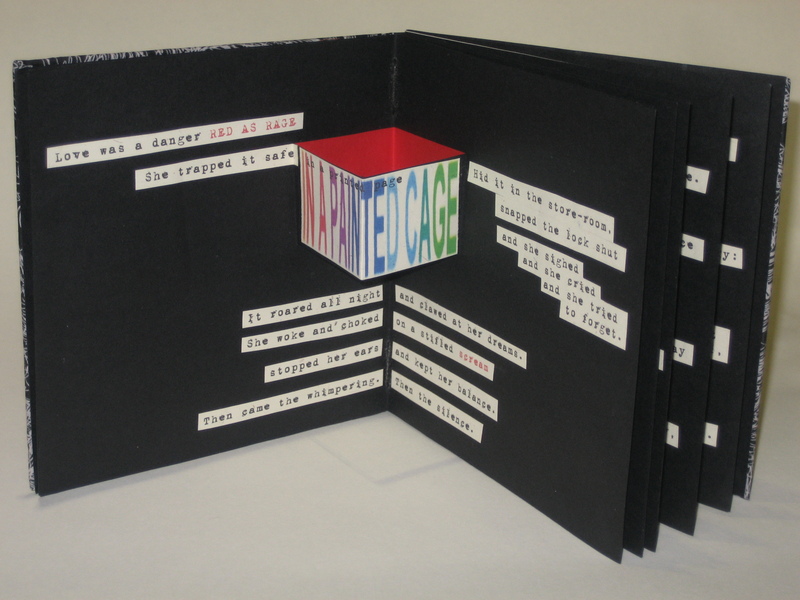 This was my first and only pop-up book, made in 2010. Since then I’ve made and sold a couple more copies. All three are slightly different. The pages are pasted back-to back to conceal the messy bits on the back. The font used for the text is 1942 Report, which gives it the feel of a ransom note or anonymous letter. The book-cloth for the cover was made from a remnant picked up at a jumble-sale. The size is 15x15cm. 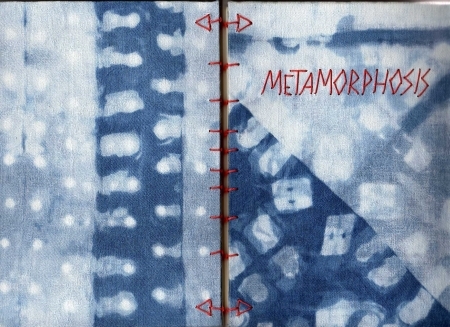 Metmorphosis (above) is about my daughter, from birth until April 2010 when she moved into her own flat, aged 25. Her story is told in poems and photographs. The cover design is inspired by moth-wings. The boards are covered with book-cloth made from Kozo paper and indigo resist-dyed linen from an old damask tablecloth. The binding is a variation on 4th century Coptic and was sewn with ten needles. The paper is Indian handmade rag-paper, with the text inkjet-printed on a very forgiving Epson CX6600. The typeface is Palatino Linotype, with Castellar for the titles. the green palm-groves of Kerala. And here is my son Gabriel, using one of the many travel-journals I’ve made for him over a few years and thousands of miles of travelling. His girl-friend’s journal is on the table beside him. he rang from San Francisco. blessed him and let him go. Below: Off the Map, a journal of my first visit to Shetland in 2009. 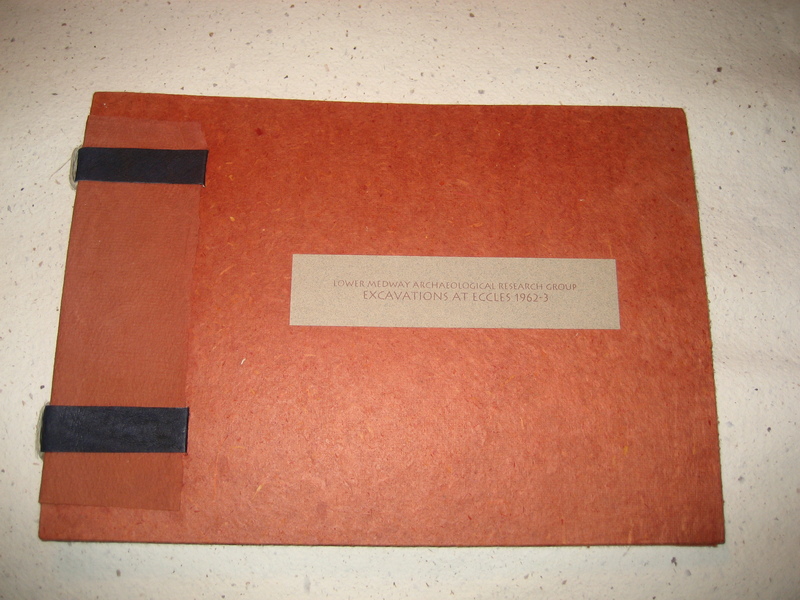 A5 flutter-book with Khadi paper cover. phosphorescent furrow through the night. Below: Orkney Journal. A flutter-book (sempūyō in Japanese) is a type of accordion book in which a single cover sheet is wrapped around the spine and attached to the first and last pages of the text-block – a style popular in China during the Song dynasty 960-1279. The pages lift of their own accord as you leaf through the book, as if eager to get on with the story. 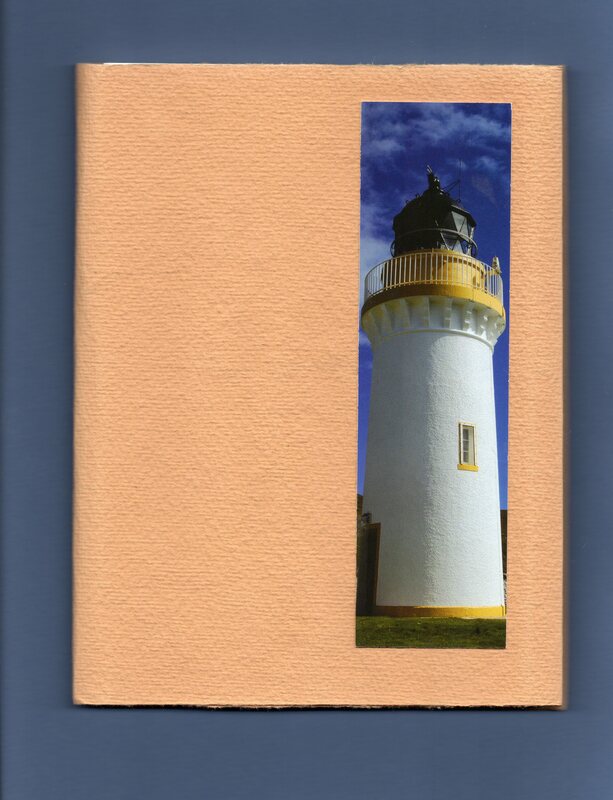 This is an account of my visit to Orkney in 2008 – diary entries, drawings, quotations, poems and photos. The cover and embroidered band are made from Khadi rag-paper. 54 A5 pages Made in 2008. 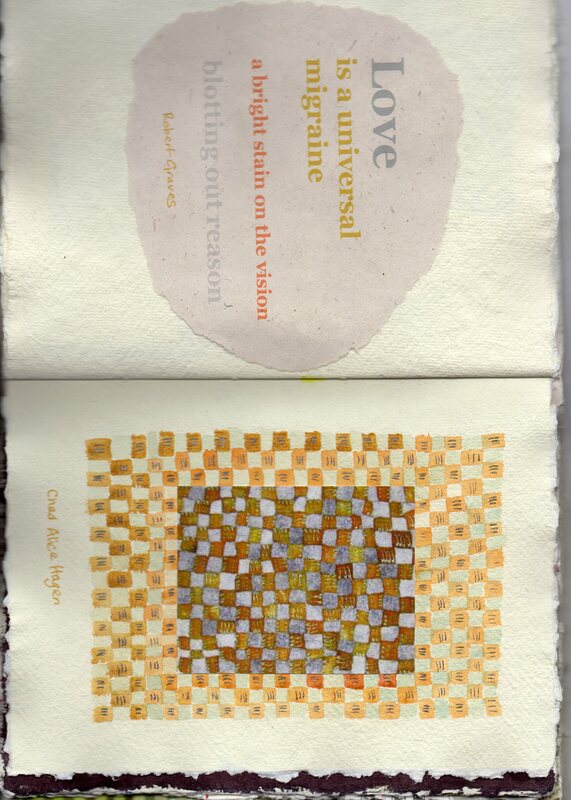 Below: Chequered, an A5 long-stitch book of Khadi paper pages, filled with images collaged, drawn and painted, and some quotations and found poems, on the general theme of chequered decoration. Made over many months 2007-8. Below: Mendip Waters, made for an exhibition in Wells Museum in 2007. The structure was based loosely on Asian Palm-leaf books, of which there are two in the museum. The subject is the underground watercourses of the nearby Mendip Hills. 14 pages, each with one line of the sonnet stitched and printed on watercolour-painted Khadi paper. Size: closed 20 x 8 x 3.5, open 20 x 112cm. This book is now in a private collection. The sonnet was published in The West Country: a cultural history by John Payne, Signal Books 2009. Below is a set of three-section A5 journals I made for my husband’s birthday in 2006. Below: Fieldwork, collage on handmade Indian rag-paper. The text is a short poem in English and Latin about the excavation in the 1960s of a Roman villa in Kent, and the skylarks that sang as we worked. Size: closed 28.5 x 13 x 2.5, open 28.5 x 80cm. 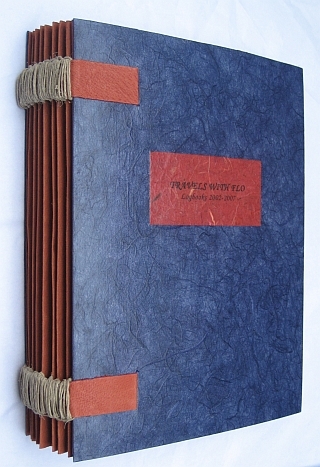 Edition of two, non-identical, 2006. 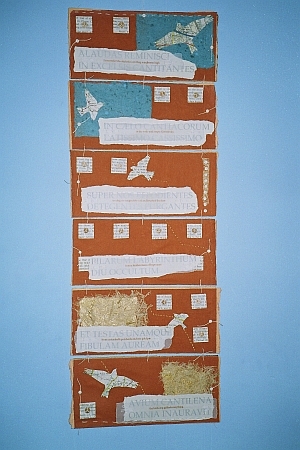 Below: Travels with Flo, commissioned by Diana Keen 2007. I had to remove 327 single pages from A4 diaries, and bind them into a single volume. I divided the pages into 8 sections, each of which I stab-stitched onto a folded Khadi paper support, which in turn was sewn onto a pair of lined leather straps. These were attached to covered boards. The whole job took ten and a half hours. Below: Excavations at Eccles 1962-3. As a practice for “Travels With Flo”, I bound some A4 photocopies of the reports in “Archaeologia Cantiana” of an excavation I took part in many years ago. This was part of my research for the book “Fieldwork”, above. Below: Python. This book is in the “collapsing star” format. When held up by its ties it shakes out into the form of a snake. The paper is handmade Indian rag-paper, painted with watercolour, and the text is stitched in waxed linen thread. The cover is made from a Malaysian batik fabric. Size 15 x 5.5 x 4.5 cm. Made in 2007. Below: Waymarks: a poem about a journey. The first draft was written on 30th August 1970, the day after my 25th birthday. I found it on New Year’s day 2003, during a period of illness, and decided to make a book of it. It seemed to be a message from my younger self to my older self. Or perhaps the other way round. 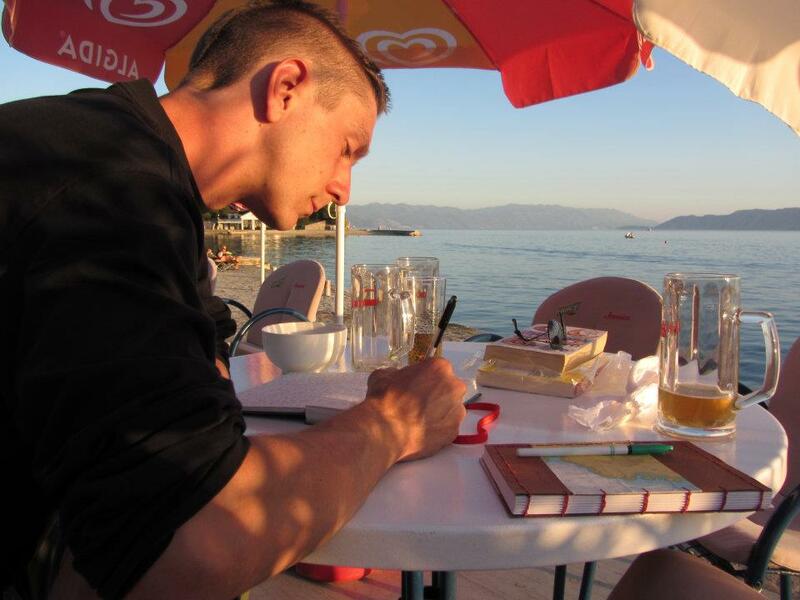 The nights of fevered fractured sleep produced dreams in which the form and structure of the book took shape. By day I revised the text and worked on the lettering – based on runes – and the images, which are mono-prints. The reader starts at the beginning and ends at the end, but the route taken varies with the order in which the right-hand and left-hand pages are turned. 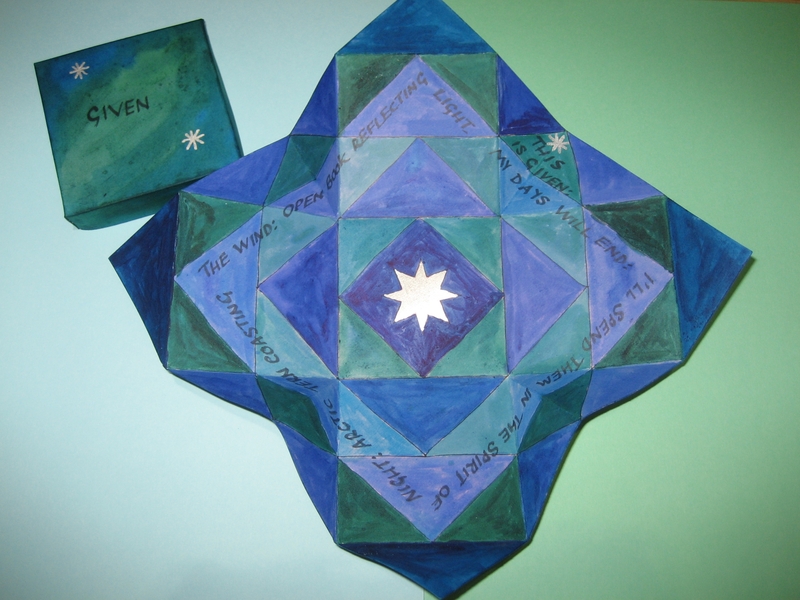 The pages are Elliepoo paper and the cover is handmade Indian rag-paper. “French Doors” format, 22 x 7cm. Made in 2003. Wow you really have the skill to make books…………………. I am more of a beginner. No instruction have I had, as of yet. I am doing an artists book course in April though so I am hoping that it will help me get a better finish on my next BAO edition. Thank you Aine. We’ve all been beginners! And I still have so much to learn. Good luck with your course. Where are you doing it and who is the tutor? “The birds are the keepers of our secret …” -Guy Garvey, Elbow, from “build a rocket boys” which I play a lot, sometimes several times a day. enjoying looking slowly this morning, and really getting a sense of this site and your work. thanks. Thank you Velma. I’ve learned so much from your blog.